Pakistan is an important partner for the Belt and Road Initiative (BRI). 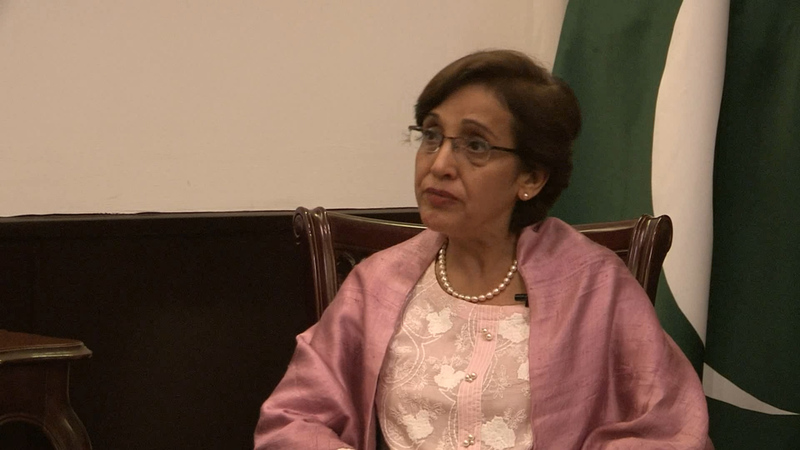 Recently, Ms. Tehmina Janjua paid her first visit to China as Pakistan’s first female Foreign Secretary. During an exclusive interview with China.org.cn, Ms. Tehmina Janjua talked about the relationship between China and Pakistan and the Belt and Road Initiative. China.org.cn: Good day, Madam Secretary. Thank you very much for granting this interview to China.org.cn. We know this is your first ever visit to China as Foreign Secretary. Could you please tell us something of your impressions or personal feelings during this trip and how the work on your visit schedule is progressing so far? Janjua: Thank you very much, thank you for this opportunity to speak to you today. I am delighted to be speaking to you, because for us, the visionary initiative of President Xi Jinping for the Belt and Road Initiative brings the commons of prosperity and development not only to our region but to many regions in the world. It is a very important initiative where for once South-South cooperation is being undertaken in a concrete way. In the past within the UN system there was endless talk about South-South cooperation, whereas this is one project, one area where you have really shown through the vision of President Xi that it can be implemented. We are delighted to be a part of this initiative and I am delighted to be in Beijing – this is my first visit to Beijing after becoming Foreign Secretary of Pakistan. It is only appropriate that the Foreign Secretary of Pakistan undertakes a first visit to Beijing because of the important relationship that we have between our two countries. President Xi has described it as “Iron Brothers,” and it is truly between “Iron Brothers” that we should visit each other at high levels, and at all levels, to reinforce this relationship between our countries. China.org.cn:As the Foreign Secretary, how do you see China's role in changing global scenario? Janjua: As for China, it is undertaking a very important role in the global scene. The vision that has been given by President Xi through this initiative at the United Nations and the community of nations is very important and has underscored the importance of South-South cooperation – that developing countries have come together to support each other and that is concrete and that is something which will happen. For years in the United Nations we have been talking about the agreement that 0.7 percent of the GNP of developed countries is to be transferred to developing countries. That has not happened; only for a couple of countries has it happened. This is where China goes to demonstrate to the world they go beyond any commitment of 0.7 percent and go beyond any commitment that is made in a multi-level context to do concrete projects in many other parts of the world as well as in Pakistan, where these projects will make an important difference in the lives of common people. China.org.cn: When we talk about Pakistan-China relations, naturally, the China-Pakistan Economic Corridor (CPEC) project and Gwadar Port development will spring to mind. So from your perspective, Madam, what is the significance or importance of the ultimate realization of the CPEC project? What is Pakistan's special role as the all-weather strategic partner of China within the framework of the Belt and Road Initiative? What are the benefits of the Initiative to Pakistan and the development of the whole region? Janjua:The last meeting of the Belt and Road forum that was led in Beijing by President Xi Jinping was a very important occasion for Pakistan because Pakistan was able to bring in not just the Prime Minister but also many other ministers and government officials, and they participated very enthusiastically in all the activities. The Prime Minister’s participation in three of the most important sessions as well as the closing statement that he made went on to demonstrate the importance that the people and the government of Pakistan partner through CPEC. We are delighted at the partnership this bilateral project has created between Pakistan and China in its implementation. It has now reached the implementation stage. It is one project where a lot of work has been done and is being implemented. Projects have been designed and implemented to directly affect the lives of the Pakistani people, whether in the energy sector, in the development of infrastructure, in the development of special economic zones, and in the development of Gwadar port. Gwadar port has created an important platform for development and for improving the economy of Pakistan. We are very happy to work with China in building this entire project, implementing this entire project for the benefit of people of Pakistan and for creating connectivity for the people of Pakistan as well as for the entire region including people of Central Asian republics, and connectivity between China and the rest of South Asia.